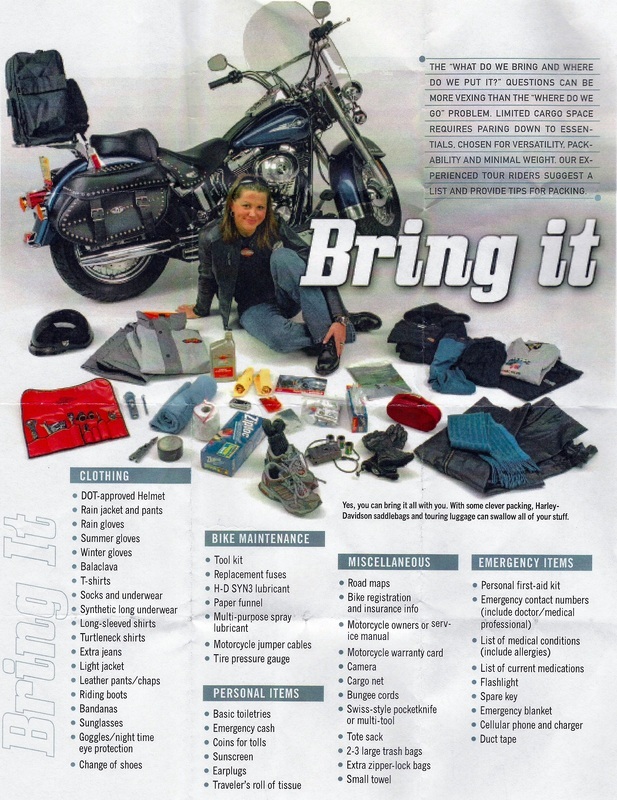 Here is a handy list of items you would normally take on every motorcycle trip. Planning to be on the Road for 50-55 days! We have asked many of our motorcycle rider friends for advice and suggestions as we started planning for this trip almost 9 months ago. We had just finished our 2009 summer riding vacation in the Smokey Mountains and Darrel starts talking about riding again in 2010. Darrel had the vision of a trip out west. Originally I was thinking about a week long ride around Lake Michigan or possibly a trip to the Black Hills and Sturgis Bike Week in August. After visiting with Darrel on the phone It didn't take long before I suggested that I might be interested in going with him on the trip out west. Darrel did most of our route planning because he has already visited many of the areas in a car or motor home. We have a few friends and relatives along the way, but we still plan to camp most nights. 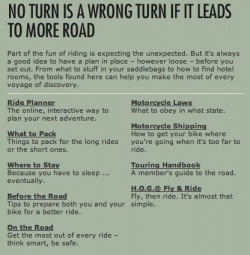 I am going to include some resources and tips others might find helpful when planning a day ride in your local area or a multi-state ride like the one we are taking. Gerbing Heated Gear is the best I have found. The quality is top notch, great warranty and priced competitively. Also note that heated gear sold at Harley Davidson dealerships under the Harley Davidson Trademark is made by Gerbing. The best heated gear manufacturer offers their product under the Gerbing trademark or the Harley Davidson trademark. Click Here to shop for Gerbing Heated gear available from HD. The enjoyment we had camping out during the trip was enhanced because of the great gear we purchased at REI. Their tents, sleeping gear and other accessories are top quality. We purchase the "backpacker" sized equipment that sets up quickly and easily. It works great for bikers because it takes up a minimal amount of space on the bike. Thanks REI for providing quality camping gear that made our daily camping enjoyable. V-Tech Motorsports - Getting the bike Gear Up! 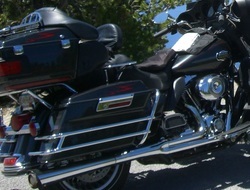 The guys at V-Tcch Motorsports did some upgrading to Lees Harley before we left in June. Thanks for getting my bike in and out of the shop in record time. I loved the new sound and enjoyed the extra performance after they added the SuperTrapp Exhaust System, PowerCommander Tuner and the Arien Ness high flow air cleaner. Before leaving on our 9500 mile trip I upgraded my Harley with new pipes! I was looking for more power and a better sound. 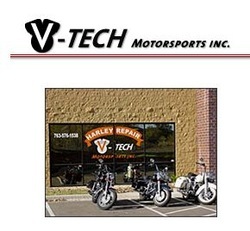 V-Tech Motorsports in Ramsey, MN recommended SuperTrapp 2 to 1 Exhaust pipes. The sound was just what I was looking for and the bright Chrome pipes look just great. I am a little concerned about the "the chrome turn blue near the manifold. I am currently working with V-Tech to resolve this issue. I will post the result here as soon as that happens. Riding on Air... that would be "AirHawk"
After much research and asking lots of rider this question, "What makes the ride more comfortable," this is the answer most given. "Buy an AirHawk." I first purchased one for my wife. She likes her time on the bike to be as comfortable as possible. I like her riding with me, so when my friendly parts and accessories guy at Zylstra Harley Davidson recommended the AirHawk, I purchased one for Carolyn. She liked hers so well I purchased one for myself. Darrel now has one for his bike as well. I also found out that the maker of AirHawk really backs up their product. Ask me about that some time.